Psiphon APK 134 is the application system that helps Android user to secure their internet access. Developed and maintained by Psiphon Inc., this application system is designed to securely bypass the content filtering systems used by government to impose censorship of internet. Psiphon is also designed to support Android users in countries which are considered to be the enemies of internet. With the concept of “SafeWeb” and “Anonymizer” was developed by the Citizen Lab at the University of Toronto. In 2007, they developed this application which is from the collaboration of research project. Then, it also consist of three separates system but still has the same basic function. The first is 3.X which is a cloud based run time tunneling system. There is also 2.X which is based secure proxy system. 1.X is the original home based server software that released by the Citizen Lab in 2004. By its development, Psiphon available and can be used in Android. There is no high difference; it has the same basic function for Android Smartphone. This application system comes to be the problem solver for the user who has problem the blocking access on their Android system. Besides, it also completed by the system for securing the process of browsing through the internet. It can help the Android users to get the proper proxy to get the right surfing through the internet. Moreover, it also builds up with the communication security and the technologies obfuscation. As the circumvention system, it comes with the combination for securing the communication and obfuscation technologies such as VPN, http, SSH, and Proxy. In the other hand, even it has been known from some years ago, many Android users that have not know yet about the existence of Psiphon for Android. Easy to download and install. No registration, subscription, or configuration required. View how much traffic you have used with in­app stats tracking. 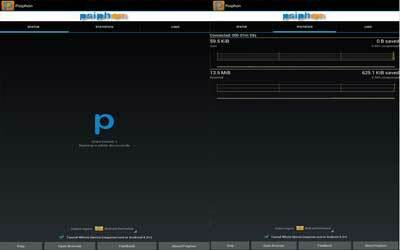 Psiphon is an open­source project subject to credible security auditing and open review.